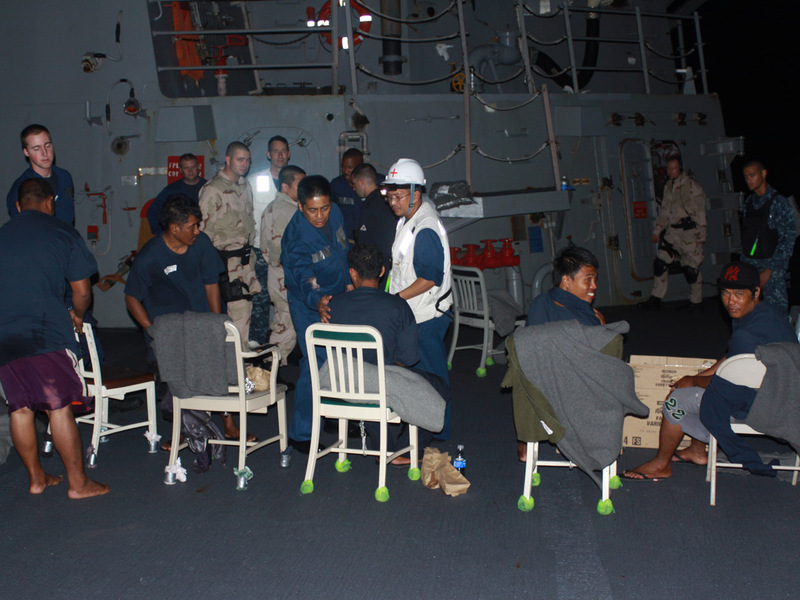 MANILA, Philippines A U.S. Navy warship rescued five Filipino fishermen Wednesday after helicopter pilots spotted them flashing a lighter in the middle of the night while standing on the roof of their sinking boat, officials said. A Navy helicopter discovered the fishermen in international waters just after midnight, hours after the fishing boat started taking on water, said Tina Malone, a U.S. Embassy spokeswoman in Manila. The guided-missile destroyer USS McCampbell, which was closest to the scene, launched two boats to rescue them. Malone said the fishermen were given a checkup and found to be in good health. They will be brought ashore when the USS McCampbell arrives in Manila on Wednesday as part of a five-day goodwill visit by the USS George Washington aircraft carrier strike group. The carrier and accompanying warships are patrolling the South China Sea in a show of American power in waters where China has been squabbling with neighbors such as Vietnam and the Philippines over who has the control of a string of tiny islands. The U.S. says it wants to keep the strategic waters, believed to be rich in gas and oil deposits, open to international navigation and has urged China and other claimants to settle territorial disputes peacefully. Washington also has a defense treaty with the Philippines and has been helping to modernize the poorly equipped Philippine navy to defend Manila's claims.